I finally decided to create a blog of my crafting efforts. I'm adding this one even though I made it months ago, since it's so dang cute :) I made this apron for Miss E just in time to bake Christmas cookies last year. 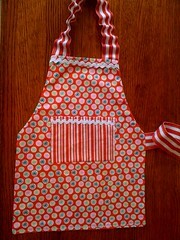 Made based on the adorable Montessori Child's Apron pattern. Luckily, Miss E was very happy with it (almost 3 year olds can be picky).